Preheat oven to 450º. In a food processor, whirl together bread crumbs, buttermilk, anchovy paste, parsley, cheese, and capers. Transfer mixture to a bowl. Add pork and mix with a wooden spoon or your hands. Form 6 to 8 meatballs. Heat oil in a large ovenproof frying pan over high heat. Add meatballs and cook, turning as needed, until browned, 6 to 8 minutes. Pour in 1/2 cup broth. Transfer pan to oven and bake until cooked through, about 15 minutes. Meanwhile, heat remaining 1/2 cup broth in a wide pot over medium-high heat. Add garlic. When fragrant, add greens a few handfuls at a time, stirring just until they wilt before adding the next batch. Sprinkle with salt to taste and the chile flakes. 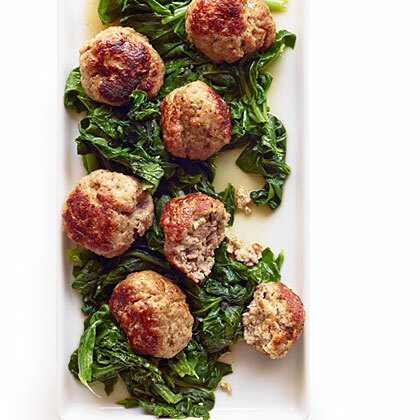 Transfer greens to a serving dish, top with meatballs, and pour any liquid from the baking dish over the greens. Note: Nutritional analysis is per serving without polenta.